Just in time for Mother’s Day, the Marin Country Mart in Larkspur will be hosting a special shopping event with Remodelista and Gardenista, two major online sourcebooks for interior design and home remodeling. 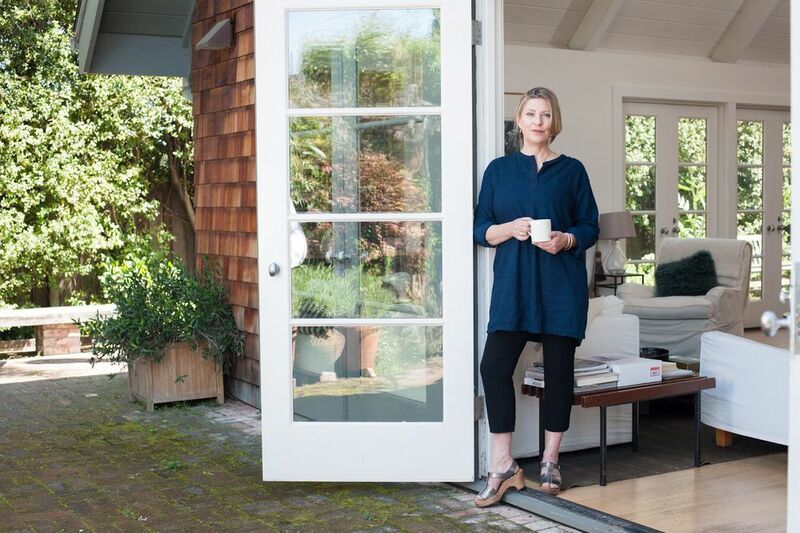 I caught up with Julie Carlson, who is Remodelista's Editor-in-Chief and a Marin mom, to learn about her favorite local spots and her blogging success. Can you tell me about the event on Saturday, May 9, from 9 am – 5 pm at the Marin Country Mart in Larkspur? We've pulled together an amazing shopping event of 40 mostly local makers who create beautiful things for the home and garden. We'll have several vendors from Marin, including Tricia Rose from San Rafael, who makes beautiful linens. She’s built a very impressive business over the last few years (Martha Stewart buys her sheets). You can find more information on our website a remodelista.com/markets. There will be a range of DIY projects for adults and kid and the Farmers’ Market will also offer mimosas to celebrate the holiday. Diesel Bookstore at Marin Country Mart will also be selling our book "Remodelista: A Manual for the Considered Home," which I'll be signing at the market. What are your favorite things to do in your hometown, Mill Valley? A perfect Mill Valley day for me would be walking to town, dropping in for breakfast at Equator, a newish coffee shop, and taking a hike on the Lovell Loop or the Dipsea Steps. I love to shop locally. If I need a present for my husband I always go to Guideboat. I also love Mint and Summer House. We’re so lucky to have a town with great independent vendors and places with personality. You can live anywhere in the world, why did you choose Mill Valley? We moved here when our children were elementary school aged. We looked at a variety of places around the Bay Area. The proximity to San Francisco and the excellent public schools drew us to Mill Valley. It wasn’t a hard decision. If you have young children, Marin is paradise. What are your favorite shops in the Bay Area? There are so many great shops here. For clothes, I love Modern Appealing Clothing (MAC) in Hayes Valley and Berkeley designer Erica Tanov, who also has a store at the Marin Country Mart and will be one of our vendors at the upcoming event. There is a fantastic housewares and clothing shop in Oakland owned by Adrienne Armstrong (she's married to Billy Joe of Green Day) and Jamie Kidson called Atomic Garden. Also The Gardener in Berkeley. What inspired you to start Remodelista? There were few blogs around when we remodeled our home in 2007. We did this very painful two-phase remodel. It was such a long and arduous experience that I felt it would make a great topic for a website. Remodelista is geared toward helping people navigate the remodel process. At the time, there were literally 20 blogs. It has since exploded. Where did the name, Remodelista, come from? We wanted the name to convey the fact that we were offering practical information rather then just being an inspirational blog. We kicked around a bunch of names, then the husband of one of the four original founders came up with Remodelista. We started Gardenista about three years ago as a companion site to Remodelista. Remodeling takes a lot of time, money, and decision making. We address everything you’re likely to go through when you do a remodel. From cabinet pulls to switch plate covers to sink selection to a lot of nuts and bolts stuff other design blogs don’t get into. We think of ourselves as being more service oriented versus just showing pretty stuff. When did you realize you wanted to turn your blog into a business? I was a freelance writer before launching Remodelista and approached it as a business from the beginning. It was never just a hobby. How did you build your readership? We have 1.5 million unique visitors to Remodelista and Gardenist. Building an audience is a slow and steady process. We did a lot of outreach, got picked up early by some really great readers such as Gwyneth Paltrow (who mentioned us in GOOP, her newsletter), Julianne Moore (who wrote the introduction to our book), and also got a mention in the New York Times. The early support of public figures who talked about us really helped. We also look at SEO, best practices, and outreach to other blogs. It took years to build a substantial readership. And things change so fast. We get a lot of traffic from Pinterest and other social media sites. Keeping up with new social media platforms is critical. I think it requires a stick-to-it-ness. A lot of bloggers who started in the early days gave up. It’s like anything, you need to decide you’re going to do it and keep plugging away at it. My observation of the blogs still thriving is that they tend to be be run by people focused on making it a business and not a hobby. We’re hosting more markets in London, San Francisco, Los Angeles, and New York. We have a Gardenista book coming out in Fall 2016 featuring several Mill Valley gardens and we're redesigning the website, which we plan to launch soon. Julie Carlson is the founding editor of Remodelista, an online magazine devoted to home living inspiration and curated product information with a savvy design-obsessed community. Visit her at the Remodelista Market on Saturday, May 9, from 9 am – 5 pm at the Marin Country Mart in Larkspur. For more information, visit the Remodelista website, Twitter, Facebook, Pinterest, Instagram and Youtube. You can also take a peek at how she decorates her house at Refinery29.